1 - THIS IS THE #1 RAREST DISNEY 1-SHEET! 2 - THIS IS THE ONLY ORIGINAL KNOWN TO EXIST! 3 - THIS POSTER HUNG AT THE WALT DISNEY STUDIO IN 1952! 4 - EVEN RARER THAN THE UA DISNEY 1-SHEETS FROM THE 1930s! Up for sale is simply the single rarest Walt Disney 1-sheet poster on the planet: A 1952 SPECIAL WALT DISNEY STUDIO ADVANCE TRANSIT ONE-SHEET - AKA SUBWAY 1-SHEET! 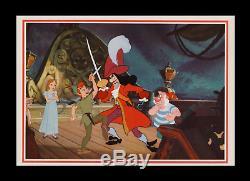 It represents the Disney version of the Peter Pan tale better than any other poster issued on the film. 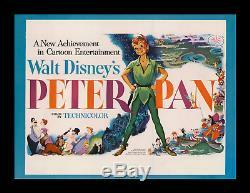 Let's face it, Peter Pan is one of the most important and forwarded stories in history. Hollywood has been making and remak. 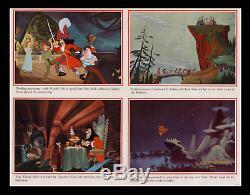 Ing different versions of Sir James Barrie's immortal literary classic continually. Steven Spielberg even tried his hand at remaking it, but this Disney version is by far the most popular and important iteration. HOW THIS SPECIAL TRANSIT 1-SHEET DIFFERS FROM THE NSS POSTER. This poster is a special rarity on numerous fronts. 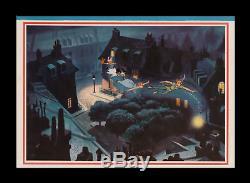 First and foremost - it's a completely different and unique design not found on any other original (or re-issue) Peter Pan poster WORLDWIDE! 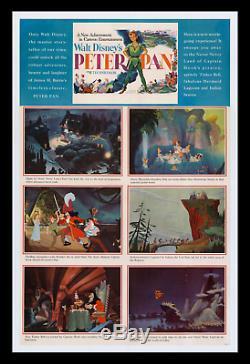 Unlike the other posters issued on Peter Pan (which still exist today in large quantities numbering in the hundreds, if not thousands), this poster is the single ONLY surviving original! The Disney Studios don't even have this in their archive. Below, I explain about its extreme rarity and why that is. Beyond the rarity, this poster is very special in that the printing of this lithograph is of much higher quality than the regular NSS [National Screen Service] issued RKO 1-sheet. Different, in that the lithograph is stupefyingly sharp and colorful as compared to the regular NSS posters. It's also a "BLEED" format poster, which is a common format for Transit 1-sheets. A bleed is a poster that doesn't have a white border all around the margin. 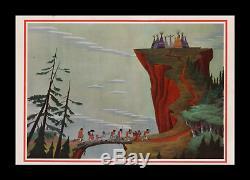 Additionally, this 1-of-a-kind original was issued as an ADVANCE in 1952 [not 1953]. ROLLED - AND NOT FOLDED. This poster was Disney's introduction to the public on the now mega-classic! 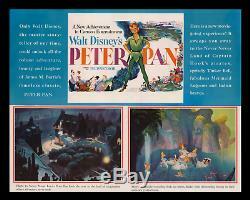 The size differs as well, as the standard (common) NSS 1-sheets on Peter Pan measure 27x41inches. This poster was issued 28 X 44 inches, which is the standard size for a TRANSIT One-Sheet issued at the time (see below for more info). Also, this poster features a spectacular design with artwork rendered by the actual animators. 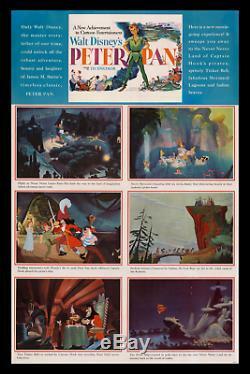 The design layout for this poster, which was later adopted for some of Disney's other features, began with this poster: The primary poster art was used at the top, and then six pieces of remarkable animation art are featured below. NSS did NOT ever issue this design for the original 1953 release or any of the subsequent re-issues, which makes this true 1-of-a-kind a true 1-of-a-kind, and, a more than significant film poster rarity! THE HISTORY AND PROVENANCE OF THIS SPECIAL ADVANCE. In 1994, NSS [National Screen Service] was nearing the end of their survival as a company. It was also a time when NSS no longer distributed any poster sizes here in the United States other than the standard (27x40 inch) one-sheet. Subsequently, by 1994, NSS was systematically printing huge quantities (tens of thousands) of j us t the standard one-sheets on all the big studio releases. Needless to say, because of the huge quantities printed in the 1990s, the standard 27x40 inch one-sheets systematically became commonplace commodities here in the USA - easily found throughout the poster hobby. Selection of product was a significant factor in making a living, and so I immediately started implementing a countermove; I took a proactive stance by looking towards finding movie posters made outside of NSS' purview. Naturally, I turned my attention towards the out-of-home media industry. Is an advertising industry term. It means outdoor print advertising: billboards, kiosks, sun-shelters, etc. Also includes other venues accessible to the public: malls, airports, transit systems, supermarkets, toy stores, etc. Use of out-of-home movie poster advertising for major Hollywood films dates back to the early 1930s. It's a tried and true - proven and tested - longstanding method of advertising "A" quality Hollywood features. Distribution networks, formats and sizes , and, the actual printing methods and/or print-shops used to make the out-of-home posters differed from that of the NSS or studio issued releases, and so for decades poster dealers didn't have any established methods or inroads into getting ahold of out-of-home movie paper. That's the primary reason this Advance Transit One-Sheet poster is so rare - in the 1950s - nobody saved these! But for a few stray examples, the out-of-home TRANSIT ONE-SHEET poster size didn't make its way into the poster-collecting world's hands - not until after the popularization of the Internet at the turn of the 21st Century. THE RARITY OF THIS TRANSIT 1-SHEET POSTER. I was able to obtain some rare Transit 1-sheets that were issued in the 1970's thru the 1990s, but I was NEVER able to find any from the 1950's or before - except for this one example. I can't stress enough how scarce this format is from this era. Pre-1960 out-of-home posters issued for movies - in any size - are practically non-existent. I've heard of less than a handful that have survived. This by far is the biggest classic that exists in an out-of-home 1-sheet! 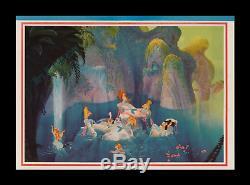 I obtained this poster in 1999 from a fellow who worked for the Walt Disney Studio in the 1950s. He said he had this hanging - pinned up to the wall in his office in 1952. He said he hung it after he saw it hanging around town. He took it down in 1954, when the film came out of release. It's the only one he had. It stayed in the tube all of those interim years away from the light. This really is a unique 1-of-a-kind poster. If you're the type of collector who wants a stellar piece on a mega-classic that nobody has, or can even theoretically get - THIS IS IT! I've priced it for a quick end of year sale. After the new year I'll be raising the price significantly, and so jump on it now if you're serious. 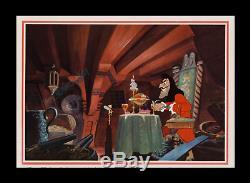 The poster itself (without the linen margin) measures 28x44 inches. SOLID VERY FINE+ MUSEUM ARCHIVAL LINEN-MOUNTED BY THE BEST IN THE US. IT'S CLEAN, SHARP & BRIGHT! As I stated earlier, this 1-sheet was issued ROLLED instead of folded. It was pinned-up in 1952, and so there was a pinhole in each corner. When the fellow I bought it from sent it to me he accidentally tore the poster. The tear was a clean tear with no paper loss, and when it came in I immediately put the poster in a protective shrink-wrap against foamcore. This prevented the tear from getting any dirt in it or getting any longer. It mended as to render it almost invisible. They leave nothing to the imagination. Nevertheless, because this poster was issued ROLLED and NOT folded, it is in FAR better shape than any of the folded regular NSS 1-sheets. Folding itself would have damaged this poster WAY MORE than the single clean tear this poster has - that's a FACT! So this poster rates a VERY FINE+ instead of NearMINT because of the tear, but it's in very top shape. I kept it in the shrink-wrap until just a few months ago. I recently had the poster linen-mounted. The poster came out PERFECT! See the direct high-res photos of the actual poster you'll be getting! Is an accepted form of poster preservation by the Library of Congress and every Museum in the country. A lot of advanced poster buyers request and prefer linen-mounted posters because it makes framing and displaying the posters much easier - without the risk of damaging the original. The white you see in photo #11 - beyond that of the poster - is the white of the Japanese paper lining the linen border margin. You can see how easy it would be to damage the original poster without that extra margin of protection. The backing makes the poster much safer to handle - it GREATLY reduces the risk of damaging the original. Also, all of my linen-backed posters have been stored FLAT so they DO NOT have a curl to them - They're all ready for framing and display! It can crash regardless of any decision you make and can even crash regardless of any decision made by the company related to the stock - Leaving you with a near worthless piece of paper that won't inspire anyone! The magnificence of art and historic documents have an inherent value that relates to civilization and society. Please write with any questions. If you're in the market for top quality original vintage movie posters or Star Wars, then please. 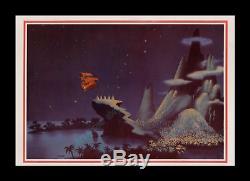 The item "1952 PETER PAN ROLLED DISNEY TRANSIT 1-SH MOVIE POSTER ADVANCE ONLY KNOWN ORIG" is in sale since Thursday, January 24, 2019. This item is in the category "Entertainment Memorabilia\Movie Memorabilia\Posters\Originals-United States\1950-59".miniver" and is located in Studio City, California.